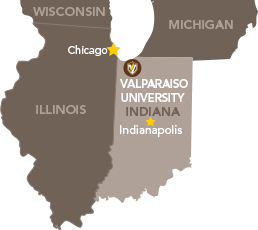 Archives & Special Collections, located on Christopher Center's third floor, is responsible for collecting, preserving, organizing, and describing the official records of Valparaiso University. The collection includes VU artifacts, audio/visual materials, books, documents, and photographs of enduring administrative, legal, fiscal, and historical value. Contact the Special Collections Librarian at University.Archives@valpo.edu to request research privileges or assistance. The Acquisitions department orders all new library materials, both print and non-print. They also do the initial review of all library donations . Technical Services and Receiving is responsible for receiving and tracking all new library materials, including periodicals and government publications. They create the records for our catalog, keeping subject headings and classification numbers consistent and accurate. The department also prepares items for shelving and use. The main circulation desk is the nerve center of Christopher Center Library, staffed every moment that the library is open. Directly in front of you as you enter the 2nd floor of the library, this is where you check-out and return library materials; find Reserve materials, pick up Interlibrary Loan materials; get change for copiers; and check the Lost & Found. They also staff a second circulation desk on the first floor near Grinders. This is where a small collection of presentation equipment and laptops that may be borrowed by current faculty, staff, and students of Valparaiso University is housed. Reservations for equipment loans (464-5774) are recommended. Have a library-related question? A Circulation Staff member will answer it or take you to a person who can. The Interlibrary Loan Office obtains research materials not available in our collections from other libraries. This service is available to VU students (although law students use a separate system; email law.ill@valpo.edu for information), faculty (current & emeritus), and staff. The Christopher Center’s Information Literacy Program helps students achieve information literacy competency across the disciplines by strengthening students’ critical thinking and research skills as they are applied in academic, professional and social contexts. Library faculty teach information literacy in both formal and informal settings. Each instruction session or research consultation is based on course assignments and needs, with sessions that range in content from a basic introduction to the Christopher Center Library and its many resources to subject-specific research concepts and skills. Designed to complement the instruction students receive in their classes, these hands-on sessions address college-level research and writing learning objectives. Students gain the skills they need to be information literate in today’s high-tech world. To learn more about how library faculty can support your course contact your subject librarian. To request an instruction session, complete the Instruction Services Request form. Consulting with a subject librarian is often the first place to begin library research. Subject librarians provide individualized assistance, helping you to develop research strategies as well as learn how to use digital and print library resources. Research Services is located at the main circulation desk and throughout the second floor. Alternatively, a consultation appointment can be made with a subject librarian. The research collection includes all types of reference resources, with an increasing number of resources available online. The research library faculty and staff maintain a number of guides to help you find the best resources for a particular research paper or project. Computers for general use are also available in the research area. The Christopher Center for Library and Information Resources is a selective depository for U.S. government publications, including maps issued by various federal departments. As such, we provide government information to the citizens of the First Congressional District of Indiana. For help with finding government information or maps contact the Government Information Librarian.